Here's a post on npr where Krulwich ponders this same topic. I tried to find some scientific sources to explain why this happens, the closest I found was an article entitled "How some birds keep their eyes on the prize" (which was eventually published) explaining the "aerodynamic trick [which] enables a bird to attain stabilized vision beneficial for the inspection of the environment." 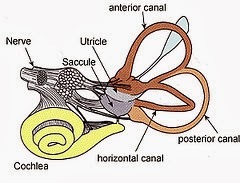 The vestibular system, located in the inner ear, is used by many vertebrates to maintain their sense of balance. It is comprised of three semi-circular canals that contain small "rocks", properly known as otoliths. Together, they provide information to the brain about the movement and location of one's head and body in space. It works like this: the three semicircular canals sense rotational movements and the otoliths sense linear accelerations. This information is integrated by the brain and used to help control eye movements so we don't become dizzy and to help our postural muscles keep us upright. So, humans participate in head-tracking, too, but birds (and some other animals) are just ridiculously good at it. (The aforementioned post also includes an owl-head tracking video, compliments of this NASA research.) 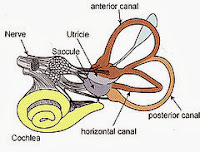 You can read WAY more about the inner ear and your vestibular system on this NASA page. Finally, according to some sources, the chicken head tracking commercials are not all that original. 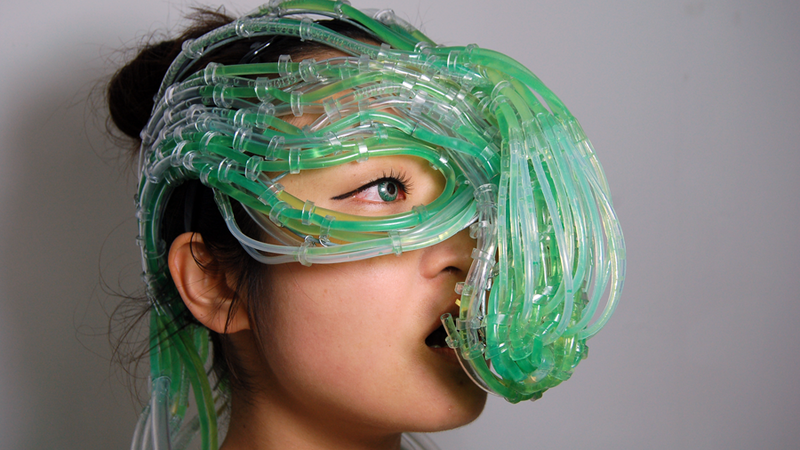 meet the Algaculture Symbiosis Suit - or algae helmet! Last year, artists Michael Burton and Michiko Nitta (known as Burton Nitta) debuted the Algaculture Symbiosis Suit outside the Victoria and Albert Museum. There, an opera singer wore the suit and sang to the crowd, generating enough new algae populations during her performance that audience members were treated to a post-show snack. According to a video clip, the "composition of the song and the singer's vocal technique are redesigned to specifically produce algae and enrich its taste. To do this, the composer and singer use the new science of sonic enhancement of food where different pitches and frequencies make food taste either bitter or sweet." But this is not just for opera singers. You, too, could wear an algae helmet! Burton Nitta call their creation Algaculture, and describes it as designing a "new symbiotic relationship between humans and algae" in which we become semi-photosynthetic! You can read more here or on their website where you can scroll down to see more pictures and an even creepier video. It's been one week since this video was posted and has become quite the meme at our middle school. This tune is one of a string of wacky videos made by Ykvis (brothers Vegard and Bård Ylvisåker) for their late night comedy show. The tune is catchy and fun, and the lyrics are hilarious! But, in reality, most of us are happy to hypothesize along with Ylvis.